LONG BEACH, Calif., Oct. 29, 2018 /PRNewswire/ -- Epson today announced it is a global sponsor of the 2018 Nature's Best Photography Windland Smith Rice International Awards Exhibition for the seventh consecutive year. As the exclusive Printer and Paper Partner for the ongoing exhibition, Epson's professional printing technology allows visitors to enjoy the "very best" in outdoor photography, celebrating the rich beauty and diversity of nature. "Continuing our important mission to cultivate and encourage public interest in environmental conservation, we are proud to again represent and showcase the most incredible spectacles of nature through photography," said Steve Freligh, awards director. "Year after year, Epson's reliable professional printing solutions allow us to display the best possible prints. And we are excited to once again see the winning photography on a larger scale with the projection mapping demonstration during the awards ceremony." The 23rd annual Nature's Best Photography Windland Smith Rice International Awards Exhibition opens Monday, Oct. 29, 2018. 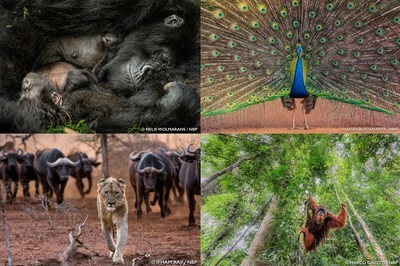 Chosen from more than 26,000 entries from photographers, the exhibition showcases 60 images from the extraordinary work of outdoor photographers in 59 countries. The images, along with an accompanying HD video, are displayed as large format prints ranging in size from 2 x 3 feet to nearly 4 x 6 feet in the museum, which welcomes more than six million visitors annually. The exhibition prints were created on the Epson SureColor® P20000 64-inch wide-format printer delivers excellent color, rich blacks, and exceptional print permanence levels. For more information, visit www.naturesbestphotography.com. For more information about Epson professional printers, visit www.proimaging.epson.com. Epson is leveraging its Pro L20000U laser projector with 20,000 lumens of color and white brightness1 and its Pro L25000U laser projector with 25,000 lumens of color and white brightness1 to create a projector mapping display during the private awards reception held in the Rotunda of the Smithsonian National Museum of Natural History. Epson is partnering with several high-end solutions companies, including All of it Now experiential design agency, Da-Lite for custom projection screens, and Nomad Event Systems for the production. Epson's laser projector solutions combine 3LCD technology with an integrated laser light source and a wide color gamut designed to deliver powerful, uncompromising images. "Whether printed or projected, Epson creates imaging solutions that support the visual arts, which is why it's so exciting to expand our partnership with Nature's Best from not only printing the amazing photography, but also projection mapping it throughout the museum's main Rotunda for the ceremony reception," said Gavin Downey, senior product manager – large venue projectors, Epson America, Inc. "We are thrilled to once again partner with industry-leading companies to showcase this extraordinary nature photography in a larger-than-life format."